From bottom center, the road heading north past The Dalles is US 197, which joined US 830 near Dallesport, and the two routes were concurrent to the east. 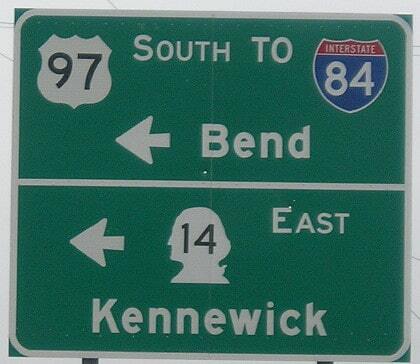 Coming north from Wasco was US 97, which was still using a ferry to cross the Columbia. 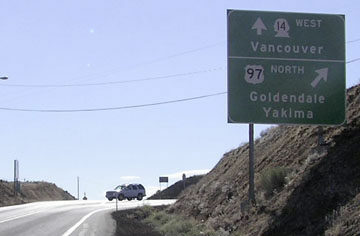 Just north of Maryhill was the junction with US 197-830, which began to the west, while US 97 continued northward through Goldendale. Southbound US 97 continues to the left with eastbound WA 14. Of course westbound WA 14 is to the right, but it is not signed that way because drivers here would have already had an opportunity to go that direction (via Spur 97). Likewise, although US 830 (and later US 197) was to the right, it probably would not have been signed here. US 830 was decommissioned in 1968, replaced with WA 14. 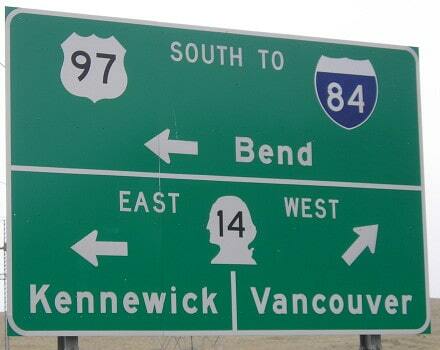 When WSDoT removed the 830 signs, they also removed the US 197 signs between here and Dallesport. AASHTO was not informed about this until nearly 40 years later, so even though the signed end of US 197 has long been near Dallesport, AASHTO's records indicated that this junction near Maryhill was its official north end until 2006 (more on the main US 197 page).